With miles of coastline, saltwater swimming and snorkeling activities are popular Mexico vacation pastimes. 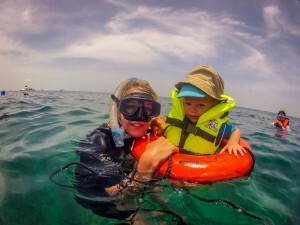 Before entering the ocean, personal safety guidelines should be in place to ensure your swim is monitored and being conducted in optimal ocean conditions. Why Buy Mexican Insurance Online? When traveling to and from Mexico, travel pros strongly suggest you buy Mexican insurance at Mexican Insurance Store.com before your journey begins. Buying Mexico insurance online allows you to make sure you get the policy you need at the best possible price. You can buy Mexican insurance and print your policy immediately, and Mexican Insurance Store.com provides the best Mexican insurance for Canadians, Americans and Mexicans alike. Buying Mexico insurance online coverage allows you to make sure you can buy Mexican insurance, and immediately get the policy you need at the best possible price. 1) Swim close to manned lifeguard stations if possible. In many upscale Mexican resorts, lifeguards will be furnished on the resort’s private beach. If no lifeguard is available, read posted signs notifying beach goers about current ocean conditions and use caution. 2) Never enter ocean water during warning times. This could be due to a tropical disturbance, water contamination or strong current. If you must go swimming, swim in the hotel pool and visit the ocean after posted danger warnings have been removed. 3) Although this caution is sometimes considered a myth, don’t eat food before going swimming, and refrain from drinking alcoholic beverages when participating in ocean activities. Wait awhile after eating to go swimming, or swim and eat afterwards. Alcohol should never be consumed as it impairs judgment and due to the enormous power of the ocean, swimmers and snorkelers should always be in full control of their bodies. 4) Before entering the ocean, examine it for hazardous sea creatures. Venomous sea life and sharks including jellyfish, stingrays, skates and Portuguese Men of War should be identifiable by performing visual scans. Since some of these creatures rest on sea beds and ocean floors, always walk slowly and shuffle your feet. This will give sea life adequate time to move without having to step on them and both parties possibly becoming injured. 5) Whenever available, purchase aqua shoes and wear them while swimming. Mexico’s waters contain sea urchins and cone shells that could possibly harm unprotected feet. 6) Always swim with a buddy. If something happens to either person, the remaining buddy can provide a thorough description and swimming account to authorities. They can also immediately contact the swimmer’s family and inform medical personnel regarding any allergies or medical conditions; should the injured swimmer lose consciousness. I want to drive safe and with my car protected. Spending time in Mexico for snorkeling and swimming is my way of of fighting stress. The car insurance I got makes me more stress-free when Im on the road. This year Mexico is my holiday destination and I am driving my own car. I followed my friend’s advice that I should buy Mexican car insurance right from home. Now I feel safe and secure knowing I will covered if I get into an accident! From our hotel, we had to drive to the beach. We were all excited about the various beach activities that we could take part in, so we were in quite a rush. Luckily Mary had bought the Mexican insurance for her car, just in case anything happened. When my group of friends and I went to one of the Mexican beaches, we saw there was an unconscious boy lying limply on the sandy beach, attended by a lifeguard. My first reaction was to offer help – so I drove the boy to the nearest hospitals using my car. I was grateful that I bought the Mexican auto insurance for my car, otherwise I might not be too confident to drive at all.